Just select the album of your choice, along with up to 50 of your favorite images, and we'll do the rest! We are proud to offer high quality products that are deservant of showcasing your loved ones in your home. All of our printed products are crafted using only professional grade photographic papers, leathers, metals and archival inks. This Brilliant album is protected with a laminate coating to give the cover a pearlescent, metallic sheen. Our custom design is unique; no templates are used in the creation of your design. Our design team is dedicated to providing a personalized design that is tailored to your individual style. From modern and elegant to classic and timeless, our custom designs are as unique as you are. Our team of talented designers creates fully customized designs within ten business days once your order is received. Once your design has been created, we will e-mail you the log-in information. You and your loved ones can review the design and use our PictureChatt as a communication tool to request revisions. Up to ten revisions all given at the same time can be made to the design at no charge. Any additional edits thereafter are charged at $20 per spread that is revised. 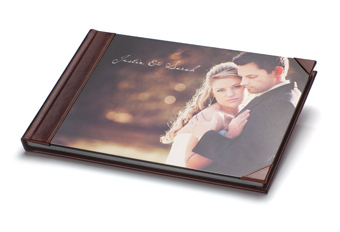 We include black art-grade paper on your Photographic Album. Our art-grade paper is a black, smooth paper which elegantly connects the book block to the cover. Your coffee table book is protected with a high gloss cover. The metallic-like sheen perfectly matches our brilliant photographic album cover. Receive access to download the high resolution images that you have selected for your portrait package with only a $100 add-on fee, or add a DVD of all of the images from your entire photo session for only $250. Additional album only pricing available up to seven days after the release of your online proofs. Additional album pricing is only for the same size album of your paid package or smaller. A new technique involving infusing dyes directly onto a treated metal surface, the Metal album appeals to those demanding a high quality presentation. Choose a color below from Premium Leather, Glam Leather or distressed leather to decorate the back, spine, and protective corners. Never lose an important element of your photo in the gutter again! Enjoy the benefits of a continuous binding with your seamless bind book. This shiny cover has a metallic look and matches the appearance of a Brilliant Album or a High Gloss Coffee Table Book. You custom cut premium leather cover is constructed seamlessly using one piece of leather. The cover is cut and produced using the finest Italian leather.